You can also call them 5 minutes desserts as they don’t need any cooking. All you have to do, is mix the flour and shape them as per choice. They can be stored in the refrigerator for up to 30 days. Take them with you in a zip-lock bag for a quick snack. Happy Friday Everyone and Wish You All a Great Weekend ! This is one of my most interesting recipe that actually came into existence after a desperate attempt to eat healthily. 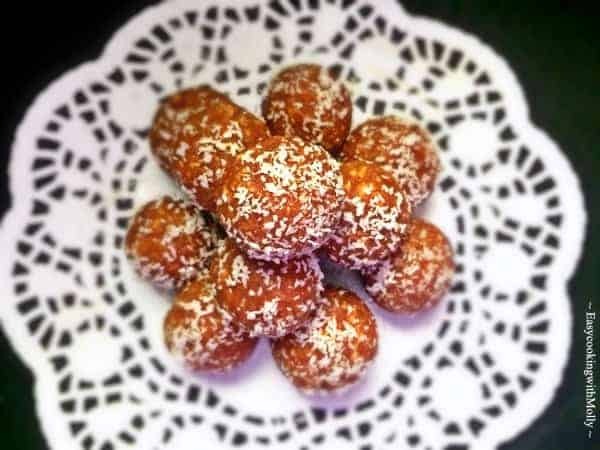 Few month’s back, I was browsing through some old pictures from India and I came across a picture of ‘Besan Ladoo‘ (a famous dessert in India made with chickpea flour) and ever since have been craving it secretly. We make it sometimes at home, however, the amount of ghee and sugar used in it, kept me off them. But every now and then, my mind kept wondering off to that picture. I finally decided to make them on my own but with healthier options. 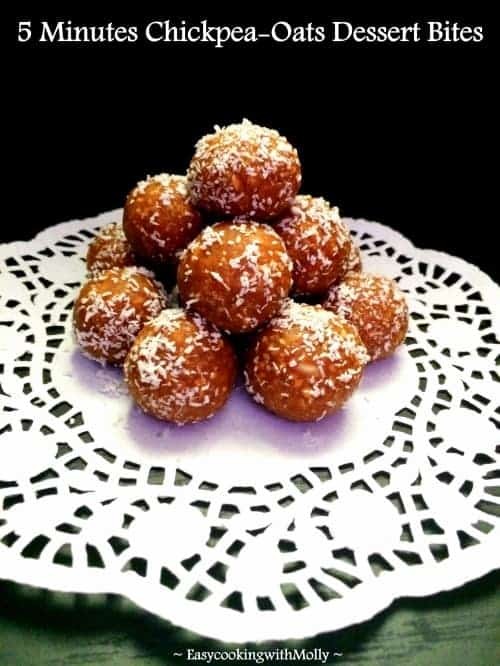 The taste of the ladoo definitely comes from the roasted chickpea flour (slow roasting raw chickpea flour over slow heat till the flour turns slightly brown and emits a sweet roasted fragrance) and ghee (clarified butter). To make my healthy version, I’m using roasted chickpea flour along with oats flour, some sesame seeds, almonds, sugar and almond butter (instead of ghee). To make them slightly more flavorful, I’m adding ginger powder and cardamom powder. Enjoy them as is or with a hot cuppa. Add the dry Ingredients in a bowl and mix evenly. Now add the wet ingredient to the dry ingredients and form a smooth dough. Divide the dough into 15-16 equal parts. Wet your hands and roll into circular balls. Roll the bites into shredded coconut to coat evenly. Transfer them in a bowl and keep in fridge for 2-3 hours to help firm. Serve when desired and keep in fridge in an air tight container. 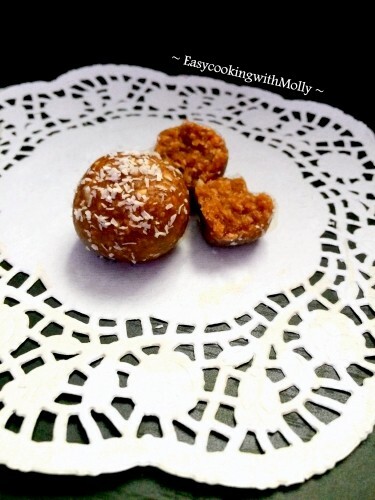 14 Replies to "5 Minutes Chickpea Oats Dessert Bites (Diwali Sweets)"
Hi Molly! I am so intrigued by this recipe – not only does it have coconut and cardamom(my two favorites). It also incorporates chickpea! Would definitely have to try this out. Thanks for sharing! Wow, both of my kids love chickpeas so this is definitely something I want to make for them. They are growing so fast right now, the added protein will be great. What a great idea! I love on-the-go snacks. this looks so intriguing! I like the idea of chickpea in a dessert! Wow they look fabulous like they would melt in my mouth! I like healthy recipes and your photography is very good.